Here you can see an RLC circuit in which the switch has been open for a long time. The switch is closed at time t = 0. 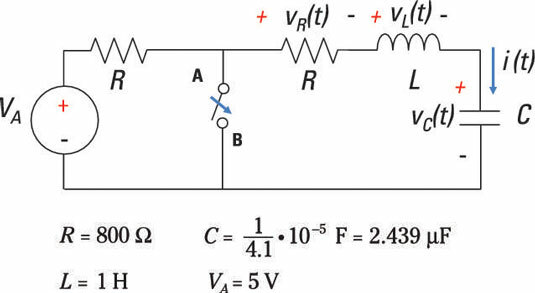 Here, vC(0) = V0 is the initial condition, and it’s equal to 5 volts. This equation uses IL(s) = ℒ[i(t)], and I0 is the initial current flowing through the inductor. Because the switch is open for a long time, the initial condition I0 is equal to zero. 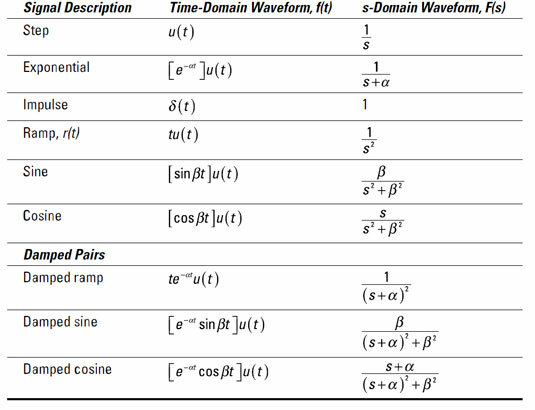 To get the time-domain solution i(t), use the following table, and notice that the preceding equation has the form of a damping sinusoid. For this RLC circuit, you have a damping sinusoid. The oscillations will die out after a long period of time. For this example, the time constant is 1/400 and will die out after 5/400 = 1/80 seconds.